​"What foods are high in Vitamin D?" ​"What are meal ideas for my son who is a picky eater?" "What are some foods that are high in fiber?" One of our Registered Dietitian Nutritionists will review your question and respond as soon possible. *Ask a Nutritionist can not provide medical advice. The information provided in response to questions sent to “Ask the Nutritionist” is intended for educational purposes only. It is not intended, and should not be taken, as the delivery of medical care. Persons requiring diagnosis or treatment, or with questions specific to a single individual, are urged to contact their local health care provider such as a doctor, dietitian or nurse for appropriate care. The information provided on this website is based on published research and current nutrition practice established by the USDA, along with Husky Nutrition Programs' staff expertise. Advice about, or recommendations regarding, specific products is not meant as an endorsement. 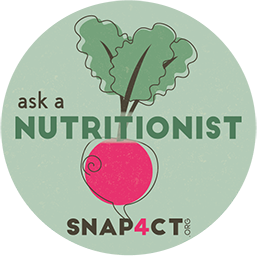 For more information on SNAP4CT policies, please visit the Non-Discrimination Statement page.